I well remember the days when Jesse was in law school and it seemed like we couldn’t go to so many different social outings because we didn’t have any money to spend. It was discouraging — and sometimes embarrassing! We wanted to be able to make friends and hang out with people, but it felt like every invite was to some place that cost money. And in those days, we literally had to use every single dollar to put food on the table and to pay our bills. The balance in our entertainment category of our budget was a big fat zero almost all of the time! Occasionally, we’d save up all our extra pennies, nickels, dimes, and would cash in the few extra dollars we’d saved over six months for a $0.50 movie from Family Video + a few items off of the dollar menu! Seriously, that was about the extent of our very rare splurging in those early years of marriage. Over time, I learned to get really creative and to think outside the box. For instance, when Jesse was in law school and some of his friends were having a party, the host asked if everyone could pay $4 each to cover the costs of the party. We didn’t have $8 extra in our budget for both of us to attend, so I emailed the host to ask if I could bring snacks and drinks (that I’d gotten for free or almost-free with coupons using money from our grocery budget) instead. She was so gracious to say “yes” to my offer — and we had a fantastic time at the party! Your frugal friends will more than likely be glad to barter skills and talents. It saves everyone money — and it saves you all a lot of frustration, too. Your frugal friends might also be interested in having regular swap parties where you swap clothes or toys your kids no longer need or even items you got for free with coupons. Your frugal friends will teach you new money-saving skills and techniques you would have never thought of or tried on your own. Pretty much every frugal idea I know of is something I’ve learned from another frugal friend. In addition, my frugal friends have challenged me to try things I probably wouldn’t have tried on my own — like making homemade soap! Whenever you’re feeling burnt out on sticking with a budget, just call or email one of your frugal friends and she’ll be sure to listen and then remind you of why you’re doing what you’re doing — and that it will be worth it. It’s a lot more fun to save money when you’re among friends who are also committed to living frugally. Plus, they’ll laugh at your crazy thrift store experiences or used car adventures. Show Up — This is the most important step! Get brave and just show up! If you don’t ever take the first step, no one is likely going to just randomly show up on your doorstep wanting to be your new frugal friend! Meet People — Talk to people at these events. Ask questions. Find out their stories. See if there is camaraderie. Don’t be discouraged if not everyone you meet becomes your fast friend. But keep putting yourself out there and showing up and asking questions and building relationships. Volunteer — One of the best ways to really develop deeper relationships is to volunteer your time. Many consignment sales offer the opportunity to help at the sale in exchange for first dibs on the items in the sale or extra discounts. This would be a great way to get to know people better and maybe find a new frugal friend or two! Teach a Class — Do you have a frugal skill such as cutting your grocery bill with coupons? Consider offering to teach a class at your local library or community center. This one-time class might turn into some lifelong friendships! Invite People to Join a Frugal Friends Club — Once you start to discover some frugal people in your area, you could invite them to join a frugal friends club. Not only would this be a lot of fun, but it would be a great way to really be inspired by others and to learn new money-saving skills! For more information on starting a frugal friends club, read this post. You just never know where you’ll find an amazing frugal friend, but if you keep your eyes open, I can almost guarantee that you’ll find some other frugal folks who live in your area! Where would YOU go to find frugal friends? Tell us your ideas in the comments! Yay! You can do it! I’m cheering for you! Crystal–you forgot to mention starting a money saving blog is a great way to meet other frugal people ;). I try to draw the frugal friends to me. I might host a “potluck” dinner, or even more frugal, a Thanksgiving leftover potluck party. I like to host card parties and game nights with clearly low expectations (as in, “Come on over! We’re serving pretzels!”). The folks who like the simple/frugal life will come–and keep coming. I also try to offer to do frugal things for friends and family members–send them good coupons I think they can use, let them know about great deals, share surplus when I get a great deal, etc. Over time, it can start conversations and connections with other like-minded folks. I love this!! What a GREAT idea to work on drawing them to you! This totally makes me think about the time a friend and I went to the clearance section of Walmart to buy flip-flops for my girls! ? I’m so glad we’re frugal friends!! That was SO fun!!! What a memory! OH! YES! I love this suggestion! I find that usually homeschool families are pretty frugal. If you are in a homeschool co-op, you’ll likely see women sitting around clipping coupons. There’s also a lot of ladies in MOPS groups that tend to be frugal minded. Oh! Homeschool co-ops! That’s a GREAT idea! What?!?! Someone was hosting a party and asked people to pay to come? Is it just me, or is that incredibly tacky? It’s actually not uncommon — at least not in my experience, especially when it’s with a group of people who are all on limited budgets (as in, it would be too much $$ for the host to cover the entire cost of the party). In this case, it was a group from law school and the host just asked everyone to pitch in to cover the costs. I didn’t find it tacky; I just knew we couldn’t afford it and we really wanted to go to the get-together! Wow! This is so true! 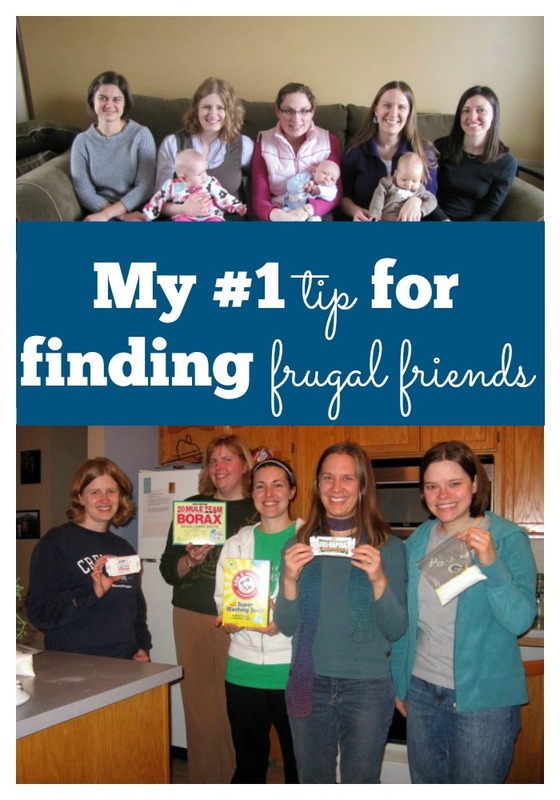 I love this post I need to find some frugal friends. I’m so glad you enjoyed this post! I hope you’re able to find some frugal friends! Crystal: Your description of the early years when your husband was in law school and you didn’t have any money really resonated. We were in the same place 30 years ago, coming out of graduate school and buried in student loan debt. In the days before there was a World Wide Web! Young adults today are so fortunate to be able to go online, research budgeting tips, debt-freedom and other financial goals, and find useful articles like yours. This was a good one. I agree! It’s amazing what’s available at our fingertips now!